In case you have way too much money and need to find new ways of blowing it. Robert Gülpen Engineering now has created a model car that is arguably much more expensive than the actual car it is a model of -- created with precious metal and gems. The body, doors and bonnet (all of which open, and should for that price) are made from carbon that's got a 1/1000mm-thin thread of gold wrapped around the fibers. The wheels (which turn, thank goodness) are made from a mix of gold and platinum, as is the interior. And the front seats are embellished with 1,400 pieces of precious stones. The headlight LEDs are made from clear diamonds and the rear lights are built using coloured precious stones. 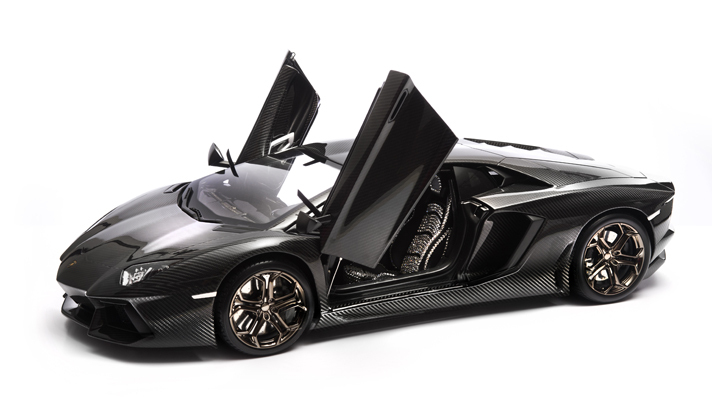 The car will be sold at auction, but bidding begins at $5 million, or £3,199,695. Or 13 actual Lamborghini Aventadors. The hammer drops this month and it'll be up for grabs from four different houses in New York, Dubai, Abu Dhabi and Beijing. Something tells me there will be enough rich people with silly money out there that the model will sell for much more than its initial asking price.